Note to readers: Some words you may not know are linked to easy-to-understand definitions in Merriam-Webster's Learner's Dictionary. Feel free to visit the dictionary to explore any additional words that are new to you. Almost 2,000 years before William Shakespeare was born, a Greek philosopher, scientist, thinker, and teacher named Aristotle wrote about dramatic performance in a treatise he called Poetics. The ancient Greeks were passionate about theater, and used plays to explore ideas about the world they lived in, including what it meant to be human. They built huge outdoor theaters out of stone where plays, songs, and poetry would be performed for large audiences. 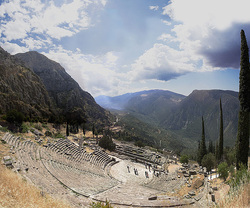 See the picture below for an example of the Greek theater at Delphi. Aristotle's Poetics is a significant piece of writing in literary history because it is the oldest-known written work to have defined the elements of drama. In addition, in Poetics, Aristotle explains several genres of drama that were familiar to audiences of his time. These genres include two that would be recognizable by Shakespeare's audiences and modern audiences alike: comedy and tragedy. Today, when we think of comedy, we think of jokes, pranks, fun, and the ever-present laugh track. However, Aristotle decided that the characters in a comedy were even more important than the action. Aristotle defined comedy as "a story of the rise in fortune of a sympathetic central character". In other words, a comedy is a play about good things that happen to a likable person that the audience can relate to. (1) The characters are ordinary people (the "everyman"). (2) The topic of the play is an ordinary situation that involves problems for the characters to solve. (3) The main character is often an underdog who ends up succeeding at solving the problem. If you think about it, these traits of a comedy play a huge role in the sitcom shows and comedy movies we enjoy today. (In fact, the word "sitcom" was created from two words put together -- "situation comedy"). It is amazing that over 2,000 years ago, an ancient Greek named Aristotle realized that everyday people, in everyday situations, solving everyday problems, can be hilariously funny -- and we still enjoy these same kinds of comedies today. According to Aristotle, tragedy is the opposite of comedy in two significant ways. While a comedy features typical everyman characters that the audience can easily relate to, the characters in a tragedy are important, wealthy, highborn, or heroic -- characters that the audience might look up to, but not necessarily have much in common with. In addition, while a comedy has a happy ending for the protagonist, a tragedy will end with tragic events (notice "tragic" and "tragedy" are similar words!). (1) A true tragedy should evoke pity and fear on the part of the audience. (2) The tragic hero must be essentially admirable and good. to be someone that the audience feels compassion for. (3) In a true tragedy, the hero's demise must come as a result of some personal error or decision. fault, perhaps caused due to the fatal consequences of a choice. As you read Shakespeare's "Romeo & Juliet," you will notice that the characters and the action of the play fit into the characteristics of tragedy exceedingly well. This is one reason why it is studied so often in schools; not only is it a great story, but it is also an excellent example of the "recipe" for tragedy as described by Aristotle. Besides defining genres of drama, Aristotle also outlined six elements of drama in his Poetics that he believed were essential for the development of a successful play. far more important than "telling" them; this makes what happens in the play -- the plot -- very significant. Whether likable underdogs or tragic heroes, the characters in a play help the audience to connect emotionally to the plot. (b) monologue (Examples include aside and direct address). These speaking techniques are explained in greater detail in the next section below. makeup, movement, and sound bring the words of a play to life. The following are examples of speaking techniques used in drama. hear. This is an example of "breaking the fourth wall." "You've been given a gift, Peter. With great power, comes great responsibility." (c) soliloquy -- a character speaks to himself or herself, relating thoughts and feelings, and as a result, also sharing them with the audience. Other characters, however, are not aware of what is being said.